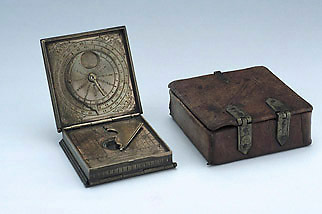 This compendium dates from relatively early in the career of the Augsburg maker Christoph Schissler. It includes a nocturnal, a lunar volvelle, a horizontal sundial, a compass, a table of latitudes, and a device for converting between equal and planetary hours. The sundial is adjustable for latitudes in the range 42 to 54? and the variable inclination of its gnomon bears a family resemblance to the technique adopted in the popular Butterfield dials of the later 17th and 18th centuries.